These days “smart home” is at the top of many homeowner’s wish list and at On Point, part of our mission is to always stay ahead of the building curve and embrace emerging technology, so our homes are never behind the times. While you may think of Nest, Eco Bee, Alexa and Ring when you think of smart homes, On Point’s integration of smart technology goes much further than being install-ready for trending tech products. In fact, our team is already thinking about how the emergence of 5G technology will change how your home operates. On Point installs a variety of items during construction to ensure your home is technology ready. 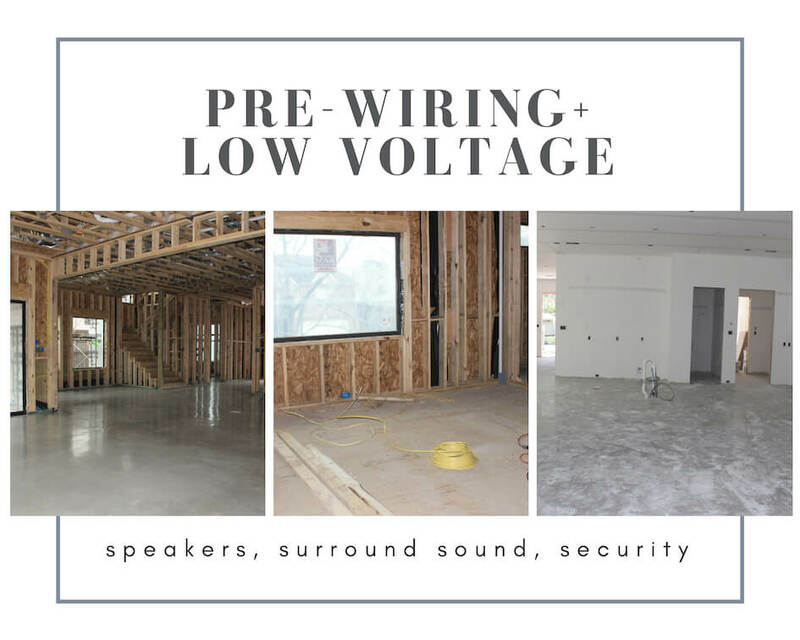 First things first, we always pre-wire every space so your house is ready for any low-voltage needs. That means your house is ready for surround sound, speakers, alarm and security features and more. In a single-family home, we pre-wire for roughly four camera locations in order to surveillance the driveway, front door and backyard areas. Your master bedroom and bathroom are ready for TVs and speakers as is your kitchen, dining room and covered outdoor spaces. The living room and any game rooms are even ready for a complete surround sound system. If one of our homes has a metal gate, we also pre-wire for an electronic strike entry system. Going above and beyond pre-wiring, at On Point we actually install a full security system in your house, so all you have to do is activate service after you move in. When you buy an On Point home, your doors and windows will have security sensors pre-installed. Additionally, we install glass break sensors and a security panel in your mudroom or off the garage entry. Many of our custom clients opt to install a second control panel in the master suite, so we always pre-wire for a second panel in the master as well. If you want to install cameras, all the wiring is complete for an easy install. Want Fiber connection? Don’t worry! We run conduit wiring outside your home so it’s Fiber ready. 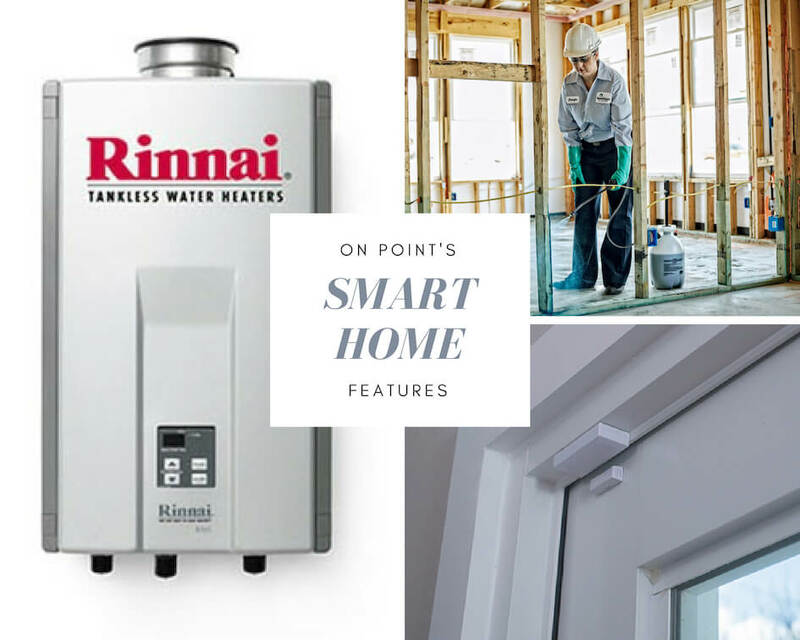 Outside of all the pre-wiring work, On Point installs Rinnai tankless water heaters with a recirculating pump in our homes. Unlike traditional tank water heaters, that hold and heat water whether or not it’s being used, tankless heaters are more energy efficient as they heat only the water that is being used. Because it heats the water as it runs, one of the biggest benefits of a tankless heater is that it will provide endless hot water. The recirculating pump that we add helps ensure that hot water comes out almost immediately, rather than waiting a few seconds to kick in. Rinnai is also known for having smart features that help alert you of maintenance issues and troubleshooting. Rinnai even has water heaters that connect to an app for phone control. Last, but not least, we install apest control systemin the walls of your home to help combat future issues. Not only do we treat the first-floor base plate wood with Borate before we sheetrock the walls, but we also run an in-wall system that allows for easy future pest treatment. The system involves a small hose with holes that is run through the walls and connects to a port on the exterior of your home. When it’s time for treatment, the pest company can hook into the hose system and spray for pests without having to come inside your home. There are endless ways to make your home tech ready and at On Point, our team is always exploring opportunities to build technology into our homes no matter the form. From WIFI and Bluetooth enabled appliances and products to sophisticated AV closets and wiring systems, your On Point home is smarter than you think! <-- NEW AWARDS FROM THE GHBA!